Morris is the best known style of ceremonial dance in England. The earliest references to it date from the 15th century and it was performed with some relish by the first Elizabethans. The dances of different areas of the country were recorded in the 19th and 20th centuries. Cotswold originated in the South Midlands, North-west in Lancashire and Cheshire, Border along the Welsh border and Molly in East Anglia. 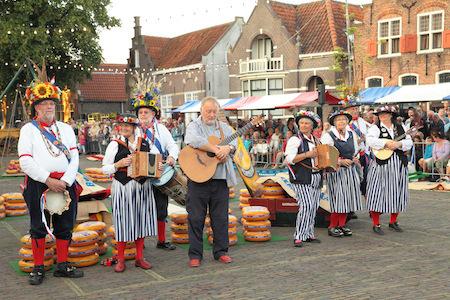 Barley Brigg dances mainly in the North-west style in elaborate and colourful costumes with the stepping accentuated by the use of clogs. Cotton rope slings, decorated sticks, wavers and bobbins are used in a variety of dances accompanied by musicians on melodeon, accordion, fiddle, penny whistle, drums, percussion and anything else that comes to hand. A bass drum is a distinctive feature. 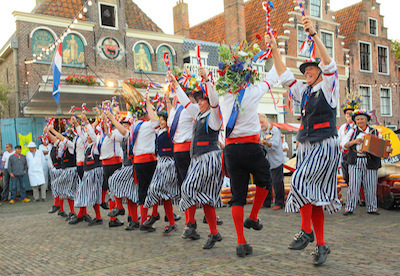 North-west morris is based on processional dances with a dance leader and eight dancers – the leader calls the figures which are generally geometric shapes. A dance consists of a repeated chorus ('step-up') separated by five or six figures and a dance-off to end. Steps tend to be march, polka (rant) or single step. Look at the Dance Programme page for a list of dances for the current season and some of the things to look out for.